Finally we are back home from our 2 1/2 month absent from being on The Texas Trip. It was great and I’m glad we got to do it so we could see everyone and to take care of the business that needed to be taken care of. It sure is nice to be back among your own things and getting back to your normal routines. I think the trip was a little long and we probably will not take another one so long. During our first moments back, our eyes are not seeing what we thought we would be seeing, at least not everything. First of all things are a bit more along than I figured they would be. Also, though some of the things are not what was suppose to happen, we understand the reasoning behind why it was changed the way it was. Okay time to explain. One of the first things we noticed is that the bakery is not where we thought it would be. It was suppose to be in the old LolyKat store, but it’s not. 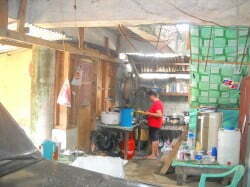 It’s in the place where Titing and Neneng sold their drinks. It’s much smaller than it was pictured in our minds, but it works. I guess the only real impact that has on us is that we will not be getting that P2000 per month that we thought. It’s a nice looking bakery though. I am not concerned about the P2000. The main thing is that the bakery is successful for them. Some of y’all are probably wondering what is going on with the old store. Well let me tell you. That is now the bedroom of Juvic and her baby, Samantha. Juvic did not want to be carrying the baby up and down the stairs. She didn’t want to take a chance that she would fall. That’s okay with me. I wouldn’t want them to fall either. Okay all you sharp eyed readers, did you catch that I said, “stairs”? While we were gone it seems that Victor has been doing quite a bit of work around here. He not only built some new stairs, but also a little room up there for himself, Judith and Grace. The stairs are again made out of the coconut wood, but this time they are not out in the open. Victor also put an overhang where it was wide open for Mother Nature to rain on. He helped close up the old store better for Juvic and all this was in addition to his regular job, working for Neneng at the Pepsi warehouse. That Victor is a working machine when he needs to be, which is most of the time. Oh, he maintains a little garden up there too. Judith has already started selling food out front. It is not as big as the one she had at the other house, but we still have plans to build the restaurant later and she will be the manager of it. Lita has been bringing the subject up more and more since we’ve been back, so I know she is still highly interested in it. I don’t know if the name Blue Gazebo will still fit though because they are talking about putting green instead of blue on it. The name Green Gazebo just doesn’t have the same zing to it as Blue Gazebo. At least not to me. We might go with it or possibly come up with something different. It will be part of the mystery. So when we got back and we go into the house for the first time, it all looked basically the same. No surprises there, except neither the refrigerator nor the freezer were connected and both of them were clean. We unlock the door to the bedroom and everything in there does look the same, because no one has been in here for the last 2 1/2 months. Definitely had to air the place out by opening the windows for about 1/2 an hour, then close them and turn on the AC after that. We also had to change the linen on the bed. I think that next time if we are going to be gone for so long, we will strip the bed before we leave so that part won’t be necessary. Next it was definitely time to take a shower. I have been use to using hot water for the past 2 1/2 months, but here we do not have any. It didn’t really matter today because I just really had to take a shower. I do plan to rectify the no hot water thing before the end of this year though. Rick Smith says that he has a device that he setup in his CR that has nice, unlimited hot water. Total cost to buy it in Calbayog City, at the time he told me, is P5000 (including installation). If we buy it in Tacloban it’s is around P3500, plus installation. Victor says he can put it up for us, so we will probably get ours in Tacloban. Well this is the part of my notes that I got lazy at. I didn’t take any notes for over a week. Really though nothing much has happen, but anything exciting that did happen it did eventually get down in my notes. I did most of the notes from The Texas Trip over a week after we returned, but those were mostly hard to forget, so that was easy. It’s just the little things around here that makes this site more personal and sometimes helps bring everything together that I failed to write down. So the rest of this post will be things that I wrote down about a week after the fact and we were already back. Finally the electric comes back on and I can plug the computer back up to let y’all know that I am back. For the next few days after returning we had around 10 brownouts. Most of them were short, but some of them lasted a few hours. We are definitely in the Philippines. I had my doubts that everyone would be able to live here in harmony. Now we have 6 more people living here: Poppa, Judith, Victor, Juvic, Grace and Samantha. Okay, so 5 1/2 people. Samantha is hardly any problem at all. She rarely cries and is in fact less trouble than some of the older kids. Judith and Victor are super nice people and are very easy to get along with. Juvic and Grace are very respectful young ladies, so no problem there. Poppa … well Poppa is Poppa. He always has a song to sing every morning, afternoon and evening. I’m not sure of what he is singing, but he sings better than I do. I figure if you are 90 years old you can do just about anything you want. A mandatory evacuation is ordered by New Orleans, Louisiana mayor Ray Nagin and Louisiana governor Kathleen Blanco as Hurricane Katrina moved nearer to Louisiana. Dutch prime minister Wim Kok announces that he will not be available for another term as PvdA party leader or prime minister after the 2002 elections. Pakistan’s National Assembly passes a constitutional amendment to make the “Qur’an and Sunnah” the “supreme law” but the bill is defeated in the Senate. Britain’s Charles, Prince of Wales, and Diana, Princess of Wales, are divorced. A mortar shell kills 38 people in Sarajevo, Bosnia. First Japanese gay pride march. A drunk motorman speeds into the Union Square station on the No. 4 line in New York City. The train derails on the curve, killing six passengers and injuring dozens. The Plainfield Tornado: An F5 tornado hits in Plainfield, Illinois, and Joliet, Illinois, killing 28 people. At an air show in Ramstein, West Germany, three stunt fighters collide; 69 people die. US Navy officer Jerry A. Whitworth is sentenced to 365 years imprisonment for espionage for the Soviet Union. The National Centers for Disease Control announce a high incidence of Pneumocystis and Kaposi’s sarcoma in gay men. Soon, these will be recognized as symptoms of an immune disorder, which will be called AIDS. An IRA bomb explodes on the Great Market in Brussels. Missionary Armand Doll is imprisoned in Mozambique by Marxist extremists. During the Olympic Games in Munich, Mark Spitz gets his first of seven gold medals in swimming events. The dollar is allowed to float against the yen for the first time. The Philadelphia race riot began. During a 200,000-person civil rights rally in at the Lincoln Memorial in Washington, D.C., Martin Luther King, Jr. gives his famous I have a dream speech. Black Mississippian Emmett Till is murdered, allegedly for whistling to a white woman and calling her baby. Nippon Television broadcasts Japan’s first television show, including its first TV advertisement. Marseille and Toulon are liberated. In Denmark, a general strike against the Nazi occupation is started. Ten suffragists are arrested when picketing the White House. 1916 – Italy declares war on Germany. The British fleet beats the German fleet in the Battle of Heligoland Bight. Queen Wilhelmina opens the Peace Palace in The Hague. Caleb Bradham renames his carbonated soft drink “Pepsi-Cola”. First known photograph of a tornado is made. The United States occupies Midway Island. Richard Wagner’s opera Lohengrin premieres in Weimar, Germany. After a month-long siege, Venice, which had declared itself independent, surrenders to Austria. The Tom Thumb presages the first railway service in the United States. Ferdinand II is elected emperor of the Holy Roman Empire. St. Augustine, Florida, established. It is the oldest surviving European settlement in the United States. Theodoric, king of the Ostrogoths defeats Odoacer at the Battle of Isonzo, forcing his way into Italy. The Pannonian general Orestes forces western Roman Emperor Julius Nepos to flee his capital of Ravenna and appoints Romulus Augustus in his place. john there is one that isfive inchs around and five tall,you have to mount to pipe to the wall nocontrol knobs,marjire krisel has these they are cheaper but if you touch the unit you get one heck of a shock a friend had one same thing would happen to him.the one i had in subic sounds like ricks was a good unit. Huh .. I think I’d rather go with the one Rick has. I’d probably electrocute myself. UJ ,lol Kuya, we found one those water heaters in town at the home depot on rosales blvd, p7500 plus free instalation, then found more choices in tacloban in a huge hardware store just outside town, bought the Aerogas model, german made i think, p5000 my neighbor installed it in 15 minutes. it replaces the old shower hear too with one that has a wall hanger mount and long flexhose for the handle. you can actually leave ours on power all day ,we don’t, but it uses no electricity till water runs through it, just watch out lower water pressure means hotter water, so don’t let any be doing dishes as you shower might get scalded. Okay, well it’s a little bit more expensive than I thought. I guess I need to look at yours to see what it actually looks like. I only have a picture in my mind, but from what you describe, the picture is wrong.